JUSTICE LEAGUE UNITED #3 written by Jeff Lemire and art by Mike McKone is a grab bag of good ideas, some solid jokes, a lot of ho-hum execution and surprisingly some rather trite cliched comic book writing. It does have, however, lots of potential. I want to like this; I like the characters; Supergirl, J’onn J’onzz, Animal Man, Adam Strange and Alanna; I feel the right approach with these characters can produce something fun and offbeat; the problem? They are trying too hard to play it straight as a superhero team comic book, and those conventions and tired whathaveyous are getting in the way a bit. I see what they are doing here with certain characters, but the execution isn’t quite as clean or as effective as it needs to be, which is surprising from Lemire. I adore what J’onn serves here in the group. I’m enjoying Supergirl quite a lot. The NuLobo is additionally oddly endearing. 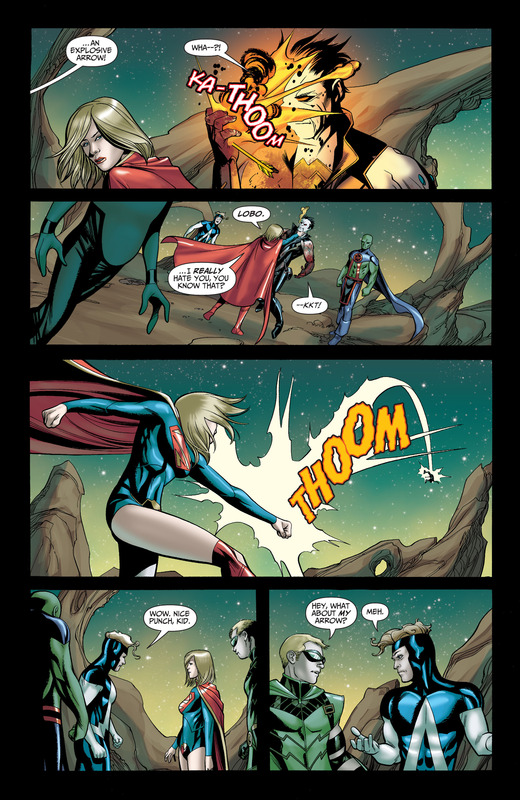 J’Onn interacting with a shapeshifting and dangerous child who had been kidnapped by another shape shifter named Blythe was more or less the highlight of this issue. It’s moments like these that I am reminded why people need superheroes; they’re meant to comfort. We need more of that. Supergirl’s general impatience and quick to be the flying brick is also rather nice. I like her as hot headed; its a departure from the just downright nasty Kara we had for a while. The anger, and her issues with it, having become a Red Lantern, are interesting parts to her character too, I’m glad to see her not as a lantern, however. Her quick to punch and pummel are adding some great comedic elements alongside Green Arrow too, especially when playing off Lobo. This whole page is gold; if the book stuck more to this tone, I would be happier. I am not a fan of this art; its stiff and awkward and colored rather poorly in most panels. I can see what things could have looked like under a slightly better artist or even just a better colorist would have made a huge difference in how this book could look like. I think a different artist would have made the plot seem better; but lets face it, Hawkman apparently sacrificing himself on a basic Wednesday like this is just lazy writing. Especially out of all people, Hawkman. The Hawks can’t catch a break and so far the reboot has done no favors to the character. Will this “death” stick? I’m not sure; I’m not entirely engrossed enough to care, and that actually bugs me. Stargirl is similarly given little to do than stand around and look surprised half the time. I understand hey, big situation, but they could have had her be a bit more active. It’s clearly more about J’onn and Supergirl here but still; magic staff and all (is it still magic?). I really do see the potential here; it’s got some good moments, and I’m waiting for Alanna to be revealed to be an alien (just give it to me already! They can’t possibly have made her human) but I feel like if they maybe leaned more towards the outrageous nature of their motley crew instead of the cliched “yet another superhero team comic” tone we’d actually have something more unique and memorable. The new character embedded in the ice at the start of the issue seems interesting, I’m interested to see where it goes with her. I’d recommend this if you like your Justice League a bit funnier but so far it’s not totally living up to what could be a really fresh book. I’m hoping it improves because I can see that potential. Check it out, maybe you can see the potential too.